I can’t resist good fries. The best french fries I have ever had were at Water World in Concord, Ca. The last time I was there may be over a decade ago! We used to get the garlic fries at one of the food stalls. You could smell them from the other side of the park and OMGoodness they were good. Hot with tons of minced garlic and infused garlic flavor. I swear they fried them in garlic oil. I always ordered more than one order since the lines were long and I didn’t want to go and wait for more. Good times. Good food. 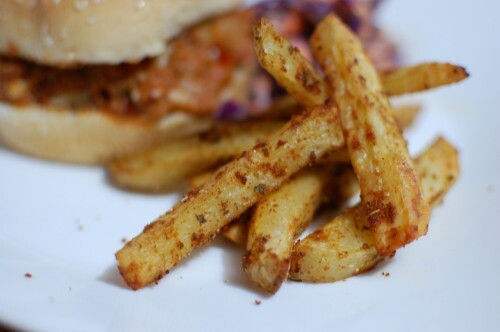 But when you have homemade french fries…well, all I can think of is food bliss. I love deep fried fries but when cooking a complete meal, I pop those potatoes in the oven for some delicious oven baked french fries, a little more healthy too. This is such an easy recipe that you will get addicted to! Delicious Rating: Yummy! This recipe combines Oregano, Cayenne, and a lot of other spices for some flavorful eating. My DH couldn’t stop eating them saying they were the best fries he ever had. Maybe he was hungry, maybe not because these were some good fries. I served them along side a vegan sloppy joe and slaw….yum! Cut potato into wedges or sticks. In a large bowl combine all ingredients together and coat potatoes well. Flip fries around on baking sheet and bake for an additional 30 or until nice and crispy.